I know that people have mixed opinions on the whole contouring situation, and I myself have yet to get behind adding it to my daily routine. It can be quite high maintenance, and I'm more of a quick makeup kind of girl when it comes to daytime makeup. I don't like to look like I'm wearing too much, and that's why I usually reserve the ashen contour products for nights out. Highlighter, on the other hand, I'm a daily user of, but in moderation and only if the product contains no shimmer. Shimmer is best left for nights at the bars and clubs only. This creamy stick duo is a definite game changer when it comes to contouring and highlighting for daytime. Each stick is sold separately, but both are only offered in a one-shade-fits-all option. 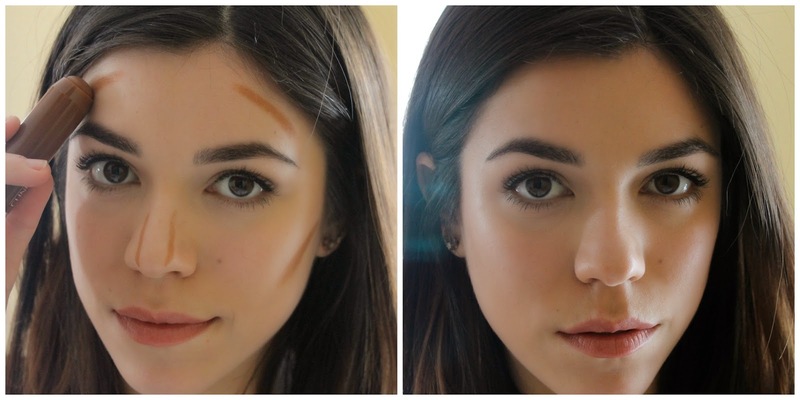 The contour comes in a shade that looks quite intimidating at first glance, as it's darker and warmer than what I'm used to using, but when blended into the skin it actually looks more natural. I attribute this to the texture of the product, which, if you've tried one of the brand's blush sticks, you'll know is silky, creamy, and beautifully blendable. I draw it along my temples, under my cheekbones, and along the sides of my nose as seen in the photo above, and blend it out with a buffing brush for flawless daytime-appropriate sculpting. I do think that this will work well on a wide range of skin colors, as it blends so seamlessly that it can be built up to your desired depth, similar to the way a bronzer works. Still yet, I think Clinique would do well releasing additional shades for this product. The highlight shade is truly a great one, as it contains absolutely no shimmer and only sheen, making it perfect for wear anytime. The color stands somewhere in between a golden and icy pink, slightly reminiscent of the Benefit High Beam, but in a much easier, on-the-go friendly form. What's great about it is that you really don't even need a mirror to apply this, as you simply can't overdo it on application. It's a total "swipe on, and tap in" glow, which sort of makes this my favorite highlight to date.